Thick, gooey, buttery brownies loaded with chopped maraschino cherries and white chocolate chips. The calendar claims Valentine’s Day is right around the corner. Raise your hands if you celebrate. Pardon me while I get a bit cynical, but I don’t participate in Valentine’s Day. Do I like jewelry? You bet your tuckus I do, but I like my jewelry to come year round. One day just isn’t enough. My feelings: Valentine’s Day is for florists, producers of pink and red, chocolate (which I love), jewelers, and fancy restaurants that require reservations 10 years in advance. Call me unromantic. Call me a hater. Call me non-festive. But, Valentine’s Day is for the birds. Nevertheless, I’m not opposed to baking for the occasion since it’s what I do anyway. Chocolate and Valentine’s Day are a package deal. kind of like sprinkles and donuts. Could you have one without the other? Sure, but why would you want to? Here’s my theory behind Valentine’s Day. I think it’s a fairly reasonable story, believable. Okay… The chocolate companies Face Timed one another… Hold up, Face Time didn’t exist — scratch that. The chocolate companies gathered their oxen and met up on the Oregon Trail. They then created some sap story about a saint by the name of Valentine that was imprisoned for holding marriage ceremonies. How it relates to chocolate, who knows, but we ate it up and, boom, Valentine’s Day was born. Whether you celebrate Valentine’s Day or not, you need this brownie in your life. Also, ladies, as you eat this brownie, you’ll forget men and Valentine’s Day altogether; it’s like they won’t even exist. You’ll no longer need a man because all you’ll want is another brownie. Honestly, romance is overrated. The center of this brownie is oozing chocolate studded with sweet cherry flavor. Not only did I add chopped maraschino cherries, but I went ahead and added a little cherry juice as well. If some is good, more has to be better, right? Because layers of chocolate are obviously better, I added a generous amount of white chocolate chips. The key to perfect brownie squares is accomplished by allowing your brownies to cool completely before cutting them with a serrated knife. Yes, I know waiting isn’t the obvious choice, but sometimes we have to do things we don’t want to do. Perfect brownie squares=cooling brownies completely. Warm brownies=a blob of chocolate mess. So, cool your brownies. Since the people demand festive themes, I topped them with mini heart sprinkles. You’re welcome. Preheat the oven to 350 degrees F. Line a 9-by-9-inch square pan with parchment that overlaps each side of the pan. Spray the pan with non-stick baking spray. In a large bowl, whisk together the sugar and the eggs until slightly pale in color, about 1 minute. Whisk in the melted butter, vanilla extract, and maraschino cherry juice until combined. Whisk in the chocolate. Using a rubber spatula, stir in the chopped maraschino cherries. Fold in the flour and salt until just combined. ***It’s important that you allow the brownies to cool completely before cutting. If you try to cut the brownies while they’re still warm, they will crumble. Today I have partnered with the lovely #HolidayFoodParty group to bring you some epic Valentine’s Day recipes. Oh, my! I’m swooning over these magnificent brownies!! Forget all that romantic stuff, just pass me a plate of these chocolate wonders!!! These look super yummy and great for Valentine’s Day! Valentine’s Day is a Hallmark holiday. All the companies just want to make money off of it. When I have a guy, I’ll be happy with some flowers ( and okay diamonds ) and spending it at home together. That’s exactly what I had in mind when I wrote this post, Laura. It’s just a money making scheme. Thanks! I mean really, all I care about for Valentine’s Day this year is getting a full batch of these brownies into my belly. It’s all I want. I agree Stephanie. I’m all about the chocolate. Agh you sound like Michael! He’s all “there should be romance all year round” and I’m like “um but I don’t get romance all year” and then he redirects meeee or brings up my proposal. Gr. Boys… Squirrel’s birthday is on Valentine’s Day, so we tend to push that to the side and celebrate his special day. Thanks! I love brownies year round not just around Valentine’s day and these look amazing! I love maraschino cherries pair with chocolate and the addition of those tiny sprinkles make them really festive. Thanks, Roxana! I agree, brownies are great all year long. I think they’d be better using dried tart cherries instead of maraschino cherries, which taste a lot like a chemistry lab smells. Okay, well, thanks for that, Allie. A recipe is just a foundation, feel free to change it up and make it your own by using dried tart cherries. Valentine’s Day or not – I need these brownies! White chocolate and cherries – count me in!! I agree… chocolate and Valentines should always go together! Awesome brownies, they look delicious! Omg you’re hilarious, Jen. It totally made my day that you referenced the Oregon Trail. I’m in full agreement with you over Valentines Day. First off, we ladies should be showered with love, attention, jewelry and dessert every day of the year. It’s a totally bogus “holiday” meant for Hallmark, florists and restaurants to squeeze exorbitant amounts of money from us. But I’d never turn down the opportunity to bake or eat desserts at this time of year, especially not these gaaaaaw-geous brownies. They’re perfect! So fudgy ‘n dense. And I love your use of white chocolate, cherries and sprinkles. Your photos and styling are beautiful! ps. your link on my blog isn’t working (dammit!). I thought I fixed it but it’s not working. I’ll take care of it as soon as I get home from work. Oh, it’s only food bloggers like us that care about the perfect squares. If no photos, I’d be digging into these while they were still warm! Yum! Such beautiful brownies my friend, delicious flavour and loving the cherries and chocolate together! These look utterly FANTASTIC. omg. I don’t care if it is for Valentine’s Day or any other day, I’d love to have your brownies and that lovely cherry napkin you have too (just pack it up and send it to me okay?). valentine’s day? meh. it’s fine; i don’t harbor any bitterness towards it other than it makes my single friends feel weird to varying degrees, as it always did me, b/c it’s a weird and unnecessary holiday. BUT: make me these brownies? cover them in these totally adorable sprinkles? YAY FOR VALENTINES. So I think you should totally send me some of these brownies because OMG CHOCOLATE CHERRY PERFECTION. Pinning!!!! You truly have some amazing ideas for recipes! Seriously, who needs Valentine’s Day or a man for that matter? I will be loving and appreciating these devilish brownies. *Dies* I so want this! Like now! These brownies look incredible, especially that perfect top! I love the idea of a cherry brownie… yum! 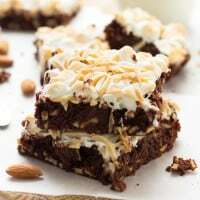 These brownies are gorgeous, and they sound so good! I love the flavors in here, definitely must try/devour them :) pinned! I participate in Valentine’s Day solely because it’s about pink, red and chocolate. I mean why wouldn’t you get in on that?! Mmm, i love that there are actual cherries in these! Pink, red, and chocolate are perfect reasons to celebrate. Thanks, Amy!